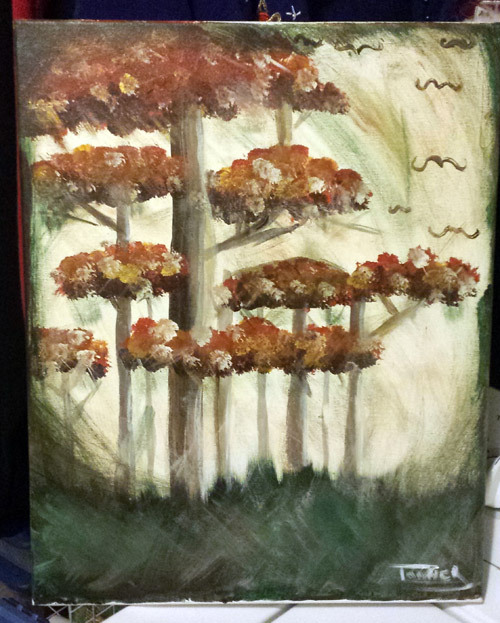 A few months ago, I went to a painting class for a friend’s birthday. There were about 20 of us lined up with paint and a canvas. 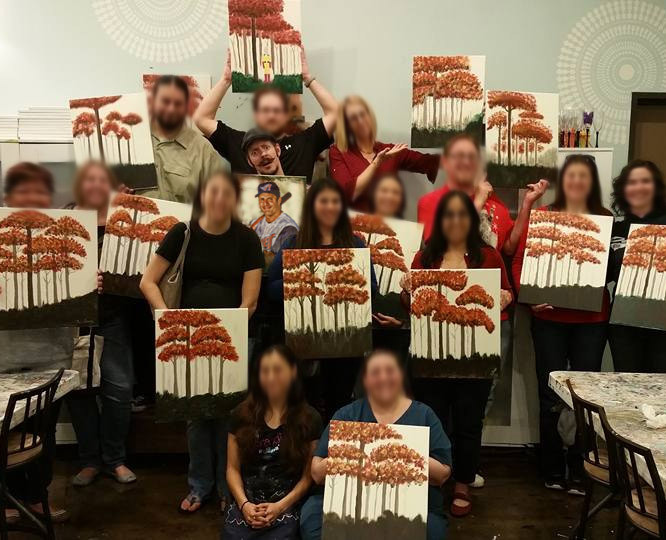 The mission: To paint the perfect tree. I’m creative enough of a guy and have all the tools everyone else does, so I figured I’d bang out the greatest painting in all the land. I ended up painting my favorite baseball player, Jose Canseco! Here are all of my “classmates” proudly showing off their masterpieces as well, with Mr. 40-40 smack dab in the middle. (I blurred the faces so as not to get sued once this article makes me millions of dollars). Okay, so maybe that is not how it went down. Perhaps my Photoshop skills are better than my painting skills. MUCH better. 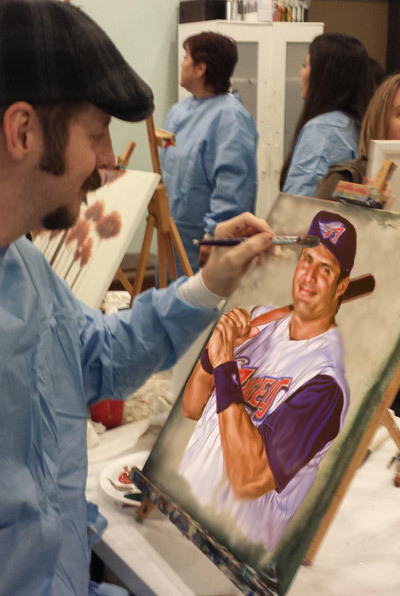 No, I didn’t paint Canseco. I did, however paint a tree like everyone else. With the entire class laughing at my efforts, I decided to go rogue and paint in a color tornado of sorts, complete with flying handlebar moustaches … Did you expect anything different from me? To tie this all in, no matter the medium, all artists start off with the same tools: a blank canvas, paint brushes and paint. The same goes for card dealers and flippers. We all have cards to sell, and know where to sell them. Why is it that some are so much more successful at it than others? I’m sure there are times when we all have had tens of thousands (if not hundreds of thousands or … gasp … millions!) of cards to “re-home”, yet it just feels like trying to sell ice to an Eskimo. For the life of them, people can’t understand how I can take a collection someone has been anchored with since they were in 8th grade and disperse it to several collectors within a matter of weeks. We all know outlets for selling- we can sell on eBay, Craigslist, COMC, online forums, Facebook and Twitter. Finding a place to sell is typically not the problem. For many, knowing how to sell is a big problem. Let’s face it. You likely have competition. Heavy competition. You may also have a lot of cards that everyone else is selling, too. So how do you move them? It’s one thing to have a 1/1 Mike Trout, but what about a mixed bag of cards from the last 30 or 40 years? Here are a few tips for you to move your cardboard. One of the chief reasons cards do not sell is because of price. This is the difference of holding onto your cards forever without any movement, and moving them quickly. There are so many people out there who place a value on a certain card based upon what a price guide says. You may have a beautiful factory set of 1991 Bowman that has a price guide value of $40. The problem: so does everyone else! Collectors should be able to pick one of these up fairly easily for $10-15, so that means that even if you had a “fire sale” at 50% off book, you still likely won’t be able to sell. Be reasonable with your pricing. This PSA 10 Manning Topps rookie sold for $113. Yes, high-grade modern era cards–even some junk wax era material–can be graded with an eye on profit. There are plenty of player and team collectors or even investors who pay to own the best of the best, regardless of what it is. Use a very critical eye when selecting cards for submission. Focus on the big names and popular players like Jordan, Jeter, Griffey, etc. Check eBay and other auction sites to see if there might be examples of “ordinary” graded cards that sold for more than $10 and see if you have any that might make the cut. It’s a bit of a dice roll so be sure to invest in a high quality lighted magnifier and do your research so you know that a market might actually exist for a specific card. You may not make any money if you don’t score a 9.5 or 10 and you’ll probably miss the mark often. However, turning a 50-cent card into a $50 card is very possible and doing that multiple times can be lucrative. You can try to sell the other graded cards that aren’t worth much on COMC where people are more apt to ‘trade’ for them with store credit. Player lots? Team lots? Singles? Venezuelan-born player lots? Steroid player lots? The options are limitless here. Different things work at different times, for different people, though. There are no set rules on how to divvy up your cards when it comes time to sell, so you just have to try various tactics. Once you find a popular niche, you now have a built-in customer base for the next time. A lot of times, if I have a huge collection to sell, I may sell off by sport, or even sell everything at once, except for the high-end stuff. That way, I can sell the high-end separately*. *A note on selling off the high-end cards separately: If you have $600 worth of cards to move and $300 of the value is wrapped up into 1 or 2 cards, if you can sell those off fairly quickly, you will only have to recoup $300 from the rest, which will drastically widen your potential buying audience. This really is a Sales 101 lesson, but with so many people selling the same thing in the same area, how will you differentiate yourself from the others? The best way is through big, clear pictures. So many times, people will try to sell their collection based off of one or two fuzzy pictures. While you know that the boxes you are showing in pictures are filled with refractors and inserts, the buyer may assume they are filled with 12,000 1990 Upper Deck Lance Parrish (no disrespect to any Parrish fans out there!) You want your pictures to be bright, clear and exciting, but not misleading. Multiple pictures will tell buyers you are serious about selling and you’re not hiding anything. If you DO have multiples of some cards, one trick I learned is on how you display them. Do you have 10 Craig Biggio rookies, 12 Randy Johnson rookies and 20 of Frank Thomas? Fan them out when taking some pictures – they show nicely that way. It sounds simple but good visuals are important–no matter what you’re selling. In addition to pictures, you also need to have a clear and concise description of what you have. I’m not talking about a checklist of every single card, but rather a broad brush overview of what you are offering while demonstrating the diversity of the collection. Bullet points are great for doing that. When you receive that initial call or email or respond to a local ad, the best way you can stand out from the crowd is to just be courteous, polite and easy to work with. When buying collections, there have been multiple occasions when I passed up a deal simply because the seller was being difficult. You would be surprised at how many people out there are losing out big time just because of their attitude. I once inquired on an item that was priced significantly higher than market value. I asked if it was negotiable, to which the seller responded “I don’t think you really want to do a deal.” His response was a self-fulfilling prophecy, because while I did want to “do a deal”, I did not want to play games. Don’t lose out on a sale (and your credibility) by being difficult to work with! If you don’t have this step down, the tips above will be absolutely meaningless after the first time you sell cards. You may have heard it before: If you have done a good job, your customer MIGHT tell two others. If you have done a bad job, your customer WILL tell 10 others! The sports card industry is filled with people trying to make a quick buck, and are willing to do anything to make that happen – even if it means being deceitful. I’ll give you a working example, so you can step in my shoes for a moment and get some hands-on … errr … eyes-on training. A while ago, I purchased a collection that was supposed to be 500,000+ cards with nothing but stars and rookies. All of the commons were gone. The seller offered them up for $1,000 and I couldn’t get over there fast enough to take a look. After chatting with seller for a while, I dove right in. The 45 minute drive there turned out to be quite disappointing, as the 500,000 cards ended up being closer to about 100,000 and there were many common cards, though the seller assured me there were none. While the seller did have good knowledge on graded cards, the value of them, etc. it baffled me as to why he would sell a 500,000 card collection loaded with stars when it was quite the opposite. There was even a high grade vintage HOF rookie that he showed me, saying that alone was worth more than the money I would pay. The problem? It was a fake. Thankfully, I knew it. We settled on $300 and while I wasn’t nearly as excited leaving as I was getting there, I figured I could make some money. After I got home and looked through everything (my favorite part!) I noticed that while some of the cards he promised to have in the lot were nowhere to be found, there were some nice surprises. I spent the next few days going through the cards and separating the “wheat from the chaff” so to speak. One thing that I made sure of is that there was enough diversity in each lot. Your average collector may not be interested in ONLY 20,000 1993 Pinnacle cards. They may, however, be interested in 20,000 cards that have all kinds of mixed years and brands. Collectors like to treasure hunt just as much as you do*. *When I say treasure hunt, I don’t mean mix up all kinds of commons and tell potential buyers you have no idea what is in there, when you have gone through the cards already and know nothing is of value is there. That is very unethical! Only tell people you don’t know what is in the lot if you truly don’t know. There have been many occasions where I have sold huge lots of cards where I simply didn’t look through most of the cards. Some buyers found nothing, where other buyers found gems. The vintage and “better” stuff was separated in one lot, where the bulk of the lower end cards were promptly pictured and posted onto Craigslist. Within a few weeks, someone ended up purchasing the bulk for the amount of money I had paid for the entire lot. He was happy to pick up the cards for a good deal, and I was happy to get my money back, and have nothing but gravy left over. I placed a few of the cards on eBay as singles, and then sold the rest as one big lot about a week later on a local buy & sell website. One of the best things about it was by using creativity in splitting up the lot, I was able to sell the cards for what they were, with integrity and not by inflating the card numbers, lying about the content of the collection or trying to pass off a fake card as real. If you have a collection you are trying to sell, hopefully these tips will help your creative juices flowing, which leads me to the biggest step: Just do it! Most people just find it overwhelming and never start. Try different methods and then stick to what works best. You can sign up to sell (or buy) on eBay here. With all that said, I wish you the best of luck in selling your cardboard. Happy collecting and, may the force profit be with you!